This handbook aims to provide managers of MPAs in the Mediterranean with step-by-step guidance to carry out a visitor use monitoring project that responds to their management issues. What management problems does visitor use raise in the MPA? What are the visitor use management objectives in the MPA? How it could be easier for managers of MPAs to take decisions based on a previous analysis and using a series of indicators in order to find the best way to develop ecologically responsible tourism in the MPAs of the Mediterranean? The MEDPAN- NETWORK OF MARINE PROTECTED AREA MANAGERS IN THE MEDITERRANEAN is an organization composed by around 100 institutions and NGOs that either have direct responsibility for managing Marine Protected Areas (MPA) or are involved in the development of MPAs in the Mediterranean. The network's mission is to promote, through a partnership approach, the sustainability and operation of a network of Marine Protected Areas in the Mediterranean which are ecologically representative, connected and effectively managed to help reduce the current rate of marine biodiversity loss. One of the network’s strategic components relates to the production of knowledge and materials devoted to reinforce the capacity of institutions to effectively manage their MPAs. In this sense, the MedPAN collection is a series of tools and user-friendly guidebooks that can provide guidance and build capacity on key issues that managers of Marine Protected Areas (MPA) in the Mediterranean have to confront daily. It is fully adapted to the Mediterranean context and is peer reviewed by MPA managers and experts of the region. It gathers tools and guidebooks developed by key players in the Mediterranean under a unified look and feel. 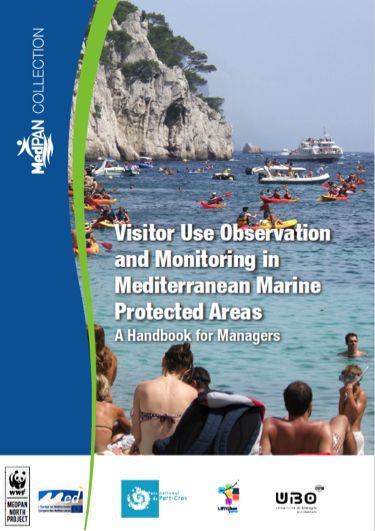 One of those publications is the Visitor use observation and monitoring in Mediterranean marine protected areas: a Handbook for managers which is created so as to help managers understand tourist uses and introduce appropriate monitoring systems in their MPA. This initiative stems from the need to develop ecologically responsible tourism which protects the natural environment of marine protected areas, considered a key resource for tourist leisure activity in the Mediterranean. Hence, to develop ecologically responsible tourism, tourist activity management should be planned as part of the management plan generally implemented within the framework of marine protected areas. In all natural protected areas, irrespective of the type, it is the managers' role to reconcile environmental pro­tection with their sites' opening to the public. Visitor impacts on protected habitats and species must be res­tricted, while fostering the positive effects of tourism on a social, cultural and/or economic level. To implement sustainable, balanced management, managers need to define the ecological conservation status of their site, and qualify the human activities to which it plays host. In this respect, knowledge and scientific monitoring of tourist use and the impacts of tourism are a necessity for managers keen to preserve the good environmental status of a marine protected area and enable managers to take appropriate management measures such as the establishment of visitor quotas, site developments (organised moorage for example), pricing policies, waste management, etc. Today, managers are in search of standardized visitor use monitoring tools that will provide the data required to render visitor use compatible with site conservation, improve visitor and local community wellbeing, boost the positive effects of tourism, improve internal manage­ment and plan for future changes. This handbook aims to provide not only an easy to use and scientifically validated tool, but also an adaptable tool to the diversity of MPAs in the Mediterranean. In terms of practice, the handbook seeks to facilitate managers of MPAs to take decisions based in a previous analysis and using a series of indicators in order to find the best way to develop an ecologically responsible tourism in the MPAs of the Mediterranean. This practice is included therefore in a context in which the improvement of management of MPAs in the Mediterranean is sought, and it represents an initia­tive that aims to provide certain answers to the many questions raised by managers of MPAs. is in line with available resources. A series of indicators presented as operational da­tasheets, to be adapted by managers to their project. A visitor use data processing and reporting protocol together with useful recommendations for project suc­cess. The handbook was elaborated under a very participatory approach. The method began with the experience of the Geographic Research laboratory LETG Brest Géomer, when it initiated scientific work on the observation and monitoring of visitor use in coastal, marine and island areas in 1995. In the Mediterranean area, LETG Brest Géomer began developing original visitor use monitoring methods in 2001 in cooperation with Port-Cros National Park (France). The National Park has had a visitor monitoring observatory, named Bountîles, since 2003. For several years now, action taken with Port-Cros National Park has aroused interest beyond local boundaries. In 2007, Géomer conducted a study (within the framework of the INTERREG IIIC MedPAN programme), to do the groundwork for an initial transfer of knowledge developed in Port-Cros to the other MedPAN network MPAs. The knowledge transfer process continued more concretely from 6 to 8 June 2011, at a seminar organised by the MedPAN Nord project. During the seminar, managers reported a great variety of experiments and raised many questions concerning methods and techniques. The presentations they gave highlighted the varying degrees of experience in the study and management of human activities. A shared need for visitor use monitoring tools thus emerged: tools that are easy to use, scientifically validated, and adaptable to the diversity of MPAs in the Mediterranean. The following figure shows the steps proposed by the guide for the visitor use study. The guide has been created by the organization of several seminars on the theme, one of which was attended by a number of Mediterranean MPA managers. This guide is the joint result of talks held at one of these meetings on tourist monitoring in marine protected areas as part of the MedPAN Nord project in June 2011, plus lessons learned from the experience of Port-Cros Natio­nal Park through the Bountîles observatory. It is based both on experience gained in the field by marine area managers and that of several teams of researchers in human and social sciences wor­king on visitor use themes. Users of the guide, i.e. mainly managers, should use it as a methodological framework based on which suggested methods they will tailor to their own area. The guide is naturally only a first building block in work on a very vast subject, the contours of which evolve in a changing socio-economic context and with the deve­lopment of nature tourism. It represents a very first initia­tive that will provide certain answers to the many questions raised by managers. Feedback that could be provided after implementing some of the indicators proposed in the guide will be vital. It will eventually help to improve and enhance the guide. From this perspective, and to further knowledge in the Mediterranean, users of this guide should share their remarks, suggestions and ideas for new indicators with other managers of MPAs in the Mediterranean. Another seminar could ultimately be planned to hold a review and to advance in research into monitoring methodologies and tools. By developing a collective, shared approach, new ideas useful for managing tourism in Mediterranean marine protected areas will emerge. The project has been developed by the GEOMER laboratory of the Brest University, and it has been coordinated and published by WWF-France and the Port-Cros National Park. It is framed within the MEDPAN north European project.